There I was, Friday night, getting ready to mix up a drink and then, as the time crept closer to midnight, blog the hell out of it in a frenzy so I could keep up with the 30-day, daily post regimen I set for myself a couple weeks back. This being Friday, I figured I might mix a few; the East India was on my list, but there was another drink I wanted to give a spin: the Ephemeral. What I didn’t count on, of course, is that Chuck Taggart would have the very same impulse to mix up this intriguing drink, and would get it online while I was still mucking about in the kitchen. But while Chuck and Wes may have scooped me on getting this drink posted first, it deserves the extra coverage. David is a bartender at Teardrop Lounge in Portland, and when I had the bottles assembled on the table for a quick photo, I realized that this cocktail has all the hallmarks of booze-geek nirvana: Dolin Blanc, the current vermouth of the moment (and a few years ago, did anyone think that there would ever be such a thing as a vermouth of the moment? 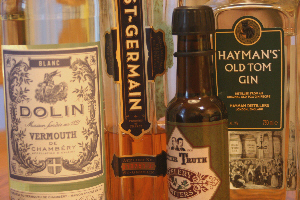 ), Old Tom gin, The Bitter Truth Celery Bitters — hell, the most mainstream ingredient in the mix is St. Germain. The Ephemeral is just that — lightly sweet, with botanicals hitting all ranges of the palate, from the lightness of elderflowers to the crisp savory flavor from the celery bitters to the deep softness of the gin. Like Chuck, I used the Hayman’s Old Tom in this as it’s what I have on hand; though having tasted the Ransom Old Tom I’d like to give it a run through the Ephemeral, as it’s on the drier, richer side of the Old Tom experience. Anyway, nice job, Dave, and thanks a hell of a lot, Chuck, for beating me to the punch with this drink. Combine ingredients in a mixing glass and stir well with cracked ice. Strain into chilled cocktail glass, squeeze a piece of grapefruit peel over the drink and use as garnish. Does it need to be Dolin or will my new-formula Noilly Prat sub OK? The more coverage this drink gets, the better — David knocked it out of the park with this one. It’s a shining example of balance and especially subtlety in the interplay of flavors in a cocktail. You do taste all the elements, but none of them is dominating or smacking you over the head. This’ll be another drink we’ll use to convert self-proclaimed gin-haters. Jared, the new Noilly will make for a drier drink at the very least, as Dolin Blanc is a sweet white vermouth. It really is worth going out of your way to find, even via mail-order if necessary. Jared – what Chuck said, though if you really want to give the drink a try and just can’t find the Dolin, you can try it with the Bianco vermouths from Cinzano or Martini & Rossi. Neither are near the Dolin in terms of quality, but neither are bad; it should give you a serviceable approximation of what Dave’s drink is like. I just tried this with the Dolan dry, and all I can say is wow, truly genius. It’ll be a few days before I have a chance to pick up the Dolan blanc, so in the meantime I’ll just have to do a comparison with the new formula Noilly. You know, for science. The Teardrop in Portland had this on their cocktail menu when I passed through in early August. They made it with Ransom gin which was, ah, not sweet at all! Wowsa, a whole different story. Just excellent…so subtle! This has all my favorites combined into a drink as beautiful as a spring cloud after a shower!